Kathy Gutierrez is one of the daughters of the late well known potter Helen Gutierrez. 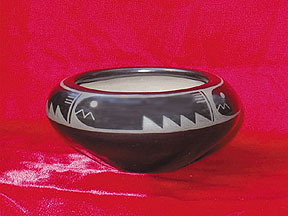 Helen was from San Ildefonso Pueblo and married into Santa Clara Pueblo. Consequently her daughters are half each but were raised at Santa Clara. 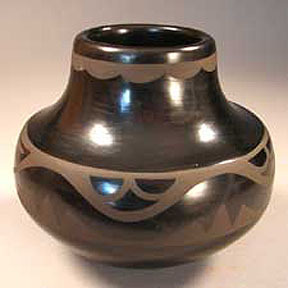 After her marriage, Helen continued to pot in the traditional San Ildefonso style and always signed her pottery "San Ildefonso." 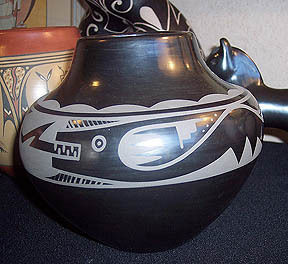 Her daughters continue to do the same, both to reflect their heritage, and the fact that their pottery is classic San Ildefonso style. 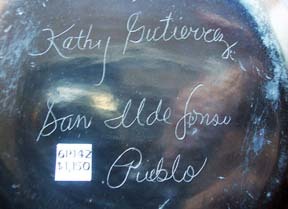 Kathy, and her sister Carol Gutierrez-Naranjo, work together on their pottery but sign individually. It is virtually impossible to tell their work apart. Like many with a San Ildefonso ancestry, Kathy is rather distantly related to Maria Martinez. 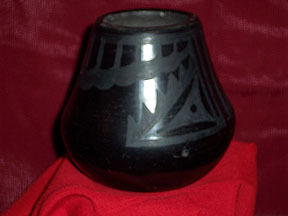 More closely, her uncle was the named painter (and occasional potter) Gilbert Atencio.